Christian Kamhaug explains the judging process while Shashank Nigam looks on. The winning entries were selected in a two step scoring process. A public vote made up thirty percent of the final score. The remaining seventy percent of the score was determined by a panel of judges coming from both the aviation industry and social media. From the aviation industry, these judges included Henry Harteveldt, Mary Kirby, and Christian Kamhaug. Based in San Francisco, Henry is a respected airline industry analyst with Atmosphere Research Group. Mary is an airline passenger experience expert and the owner of Runway Girl Network. She is based in the Philadelphia area. Christian is an Oslo based PR consultant with Gambit Hill & Knowlton. Where he leads the digital and travel industry teams. Previously, Christian was the head of social media at Scandinavian Airlines (SAS), where he was a SimpliFlying award recipient. For the first time, this year’s panel also included representatives from some of the most influential social media companies. David Mogensen is a business to business expert with Google and YouTube. Hillary Gurber is a sales executive for Google who focuses on the travel industry. Finally, Brian Carr is a travel and tourism expert with Twitter. KLM accepting one of their awards. The first award presented was for the Best in Customer Service Using Social Media. The winner in this category was KLM Royal Dutch Airlines. KLM’s 150 person social media team answers an average of 40,000 questions per week across a wide variety of social media platforms. Their average response time is 23 minutes, and the airline rolled out a feature earlier this year where an estimated response time for all Twitter inquiries is automatically updated every five minutes. The other airlines receiving recognition in this category were Virgin America and Southwest. 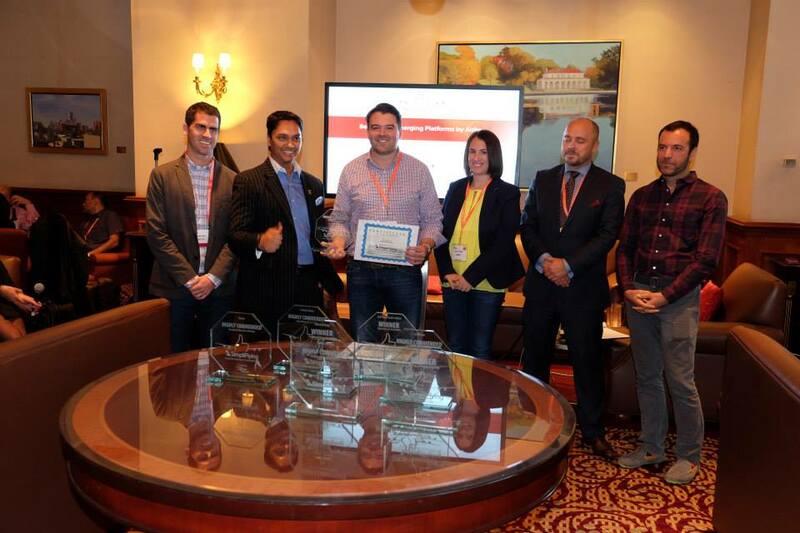 Next up was the award for the airline that was Best in Driving Revenue Using Social Media. KLM also won this category with their multifaceted approach. From their automated @KLMfares service to social payment options that bypass the website and beyond, KLM generated $20 million in revenue via social media last year. Coming in a close second place was Canadian airline WestJet. Their Christmas Miracle video went viral in December 2013 with 35 million views. However, views were not all they received as a result. In the weeks that followed, the number of bookings jumped 77 percent from the same period a year before, and revenue increased 86 percent. Up next was the award for the Best Use of Emerging Platforms by an Airline. 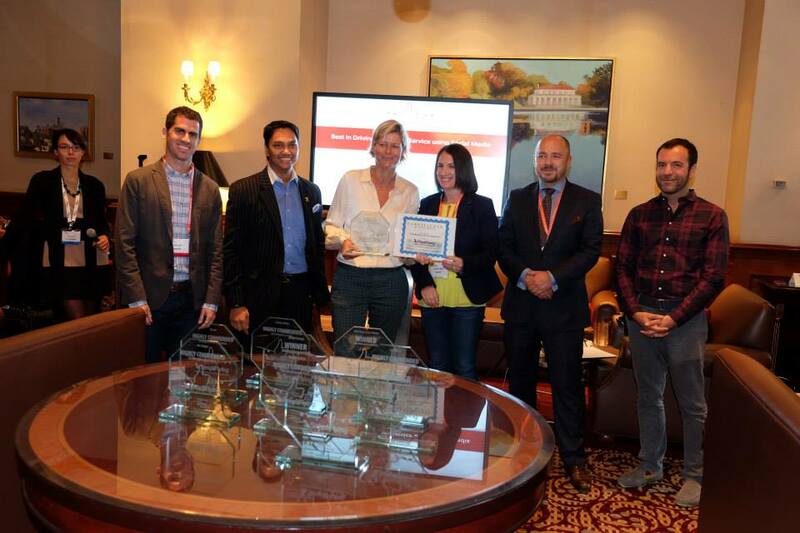 The winner in this category was Qatar Airways for their use of Pinterest and Instagram. On Instagram, the airline created the #Destigram hashtag. The idea was to use photos to help users answer the question, “Where should you go in 2014?” The airline’s efforts on Pinterest included a map of where their FC Barcelona livery 777-300ER had travelled. Users could submit their own photos of that plane in different destinations around the world. 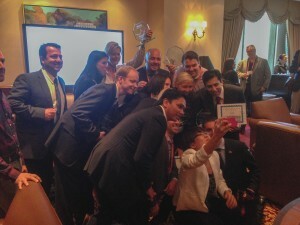 Other airlines receiving commendations in this category were Aer Lingus for their use of Snapchat and Turkish Airlines. Turkish Airlines took home the award for Best Campaign by an Airline. Their Selfie Shootout campaign pitted their brand ambassadors Kobe Bryant and Lionel Messi against each other. Using the airline’s global network, the two superstars set out on what was billed as an epic selfie-taking battle. The whole thing was captured in a YouTube video that received 105 million views in 9 days. That made it the most watched YouTube ad of 2013. Concurrently, a pair of interactive projects were launched that increased the campaign’s reach: the Tripadvisor Ultimate Photo Travel Wall, and the airline’s Selfshot iOS app. 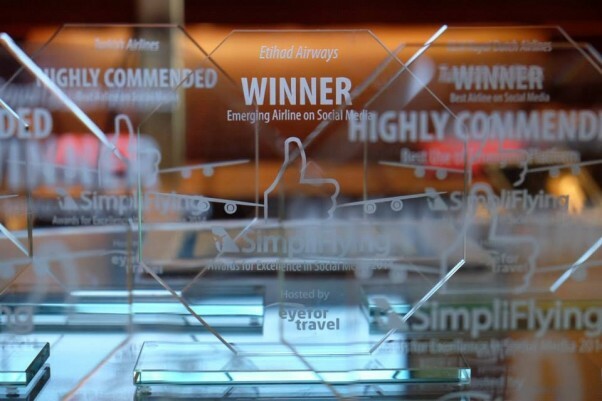 The finalists for the Best Emerging Airline in Social Media were three Middle Eastern airlines: Etihad, Emirates, and Flynas. Etihad took home the top honors for their increased efforts over the last couple of years. While Etihad has had a presence on Twitter and YouTube since 2009 and a Facebook page since 2011. 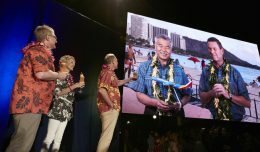 The airline has redoubled their efforts over the past year. They now have dedicated YouTube channels in Italian and German. 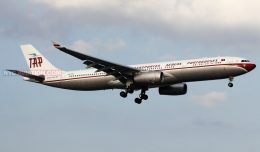 Italy and Germany are home to Alitalia and Air Berlin, two airlines in which Etihad is a major stakeholder. They also launched a dedicated Arabic Twitter channel a year ago. The award recipients, judges, and hosts pose for a selfie following the presentation. Photo courtesy Ben Granucci. The final award to be presented was for the Best Airline on Social Media. The winner, somewhat unsurprisingly, was KLM. 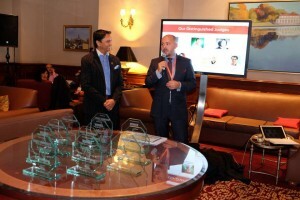 They beat finalists Turkish Airlines and Lufthansa for the top honors. Their win was reflective of their numerous successful social media campaigns over the past year. One of these was April 2013’s KLM Space contest. People from around the world were given a chance to guess where and at what altitude a high altitude balloon would pop. The closest guess won a ticket to board a flight to space. The next month, the Airline launched Aviation Empire. The game for iOS and Android challenged users to build and run an airline. KLM’s branding was used heavily in the game, including bits of KLM’s history that were presented as a player progressed. 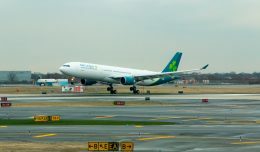 More recently, the airline has moved to social media efforts that are more directly linked to the airline’s operations. In addition to the aforementioned KLM Live Service Monitor and KLM Social Payment, there have been several other efforts launched. KLM Wannagives utilized social media to allow the airline to present personalized gifts to passengers on board. KLM Mystery tickets offered 99 Euro tickets for sale on Mondays for travel that Friday. The catch? You wouldn’t know where you were going until Tuesday. And KLM City Selfie encouraged people worldwide to share their favorite places through a video selfie. Whether they were declared the winner or highly commended, each of the award recipients present were very proud of their accomplishments. For the representatives from Southwest Airlines, their highly commended recognition was the icing on the cake after a very exciting week. And for Paul Buckley from Aer Lingus, their highly commended award was motivation to continue their Snapchat inspired ways. 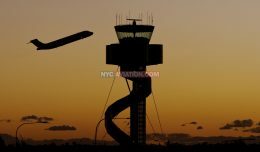 Ben Granucci, Associate Editor, is an aviation enthusiast and planespotter based in New York City. Growing up in Connecticut, he has had his eyes toward the sky for as long as he can remember. He can be reached on Twitter at @BLGranucci or through his blog at Landing-Lights.com.